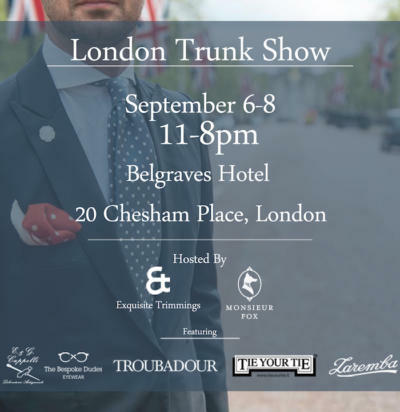 There’s an interesting trunk show next week in London. Online stores Exquisite Trimmings and Monsieur Fox are combining to organise a show that will feature several of the brands they sell, plus some artisans. 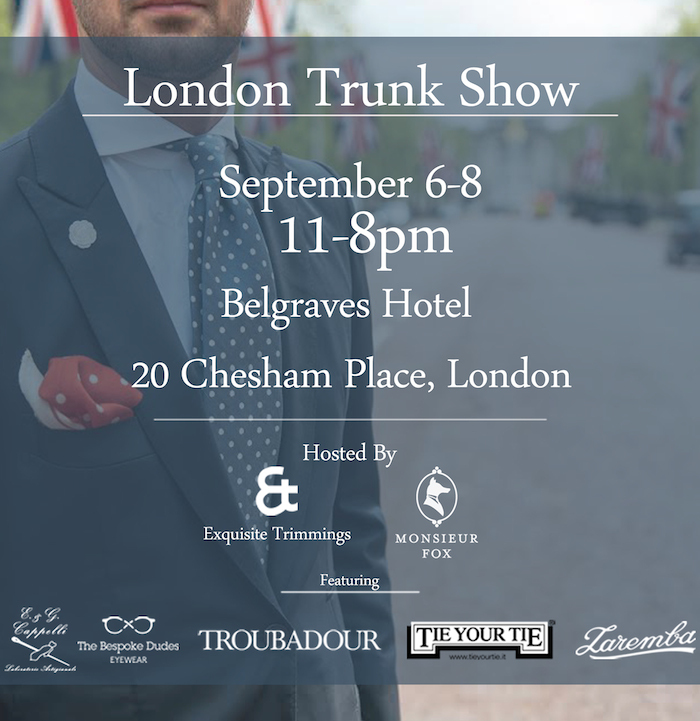 The show takes place from Sunday to Tuesday, September 6th-8th, at the Belgraves Hotel. On Sunday there will be representatives from Thomas Riemer, Polish tailor Zaremba, Codis Maya, EG Cappelli and Tie Your Tie. There will also be a drinks event that evening, in order to socialise with all the makers. Bespoke or made-to-order options will be available from those brands on the Sunday, and ready-made the other days. Fabio Attanasio from The Bespoke Dudes will be there on the Tuesday, offering his sunglasses, and they will be selling the Permanent Style 2015 book. You can follow the discussion on Exquisite Trimmings and Monsieur Fox trunk show by entering your email address in the box below. You will then receive an email every time a new comment is added. These will also contain a link to a page where you can stop the alerts, and remove all of your related data from the site. Wow…just received my first ‘tie your tie’ it’s a beautifully crafted work of art. Do you know any UK seller’s apart from Exquisite Trimmings Simon? They're both from Adret - the t-shirt is the base layer I referred to. Sorry, I should have labelled them.